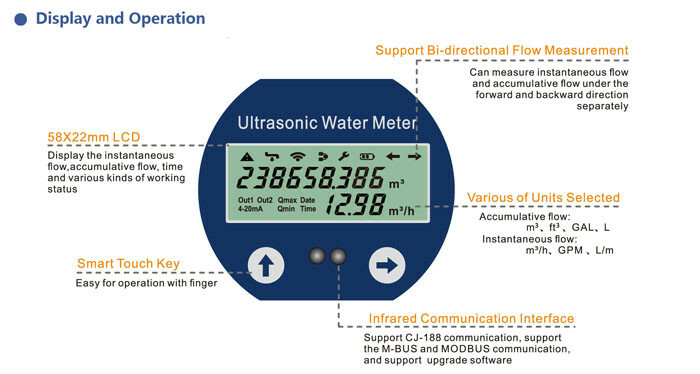 Ultrasonic water meter_Dalian Sonic Meter Co.,Ltd. 1. Designed strictly according to GBT 778.1-2007,ISO-4064,JJG162-2009 standard. 2. 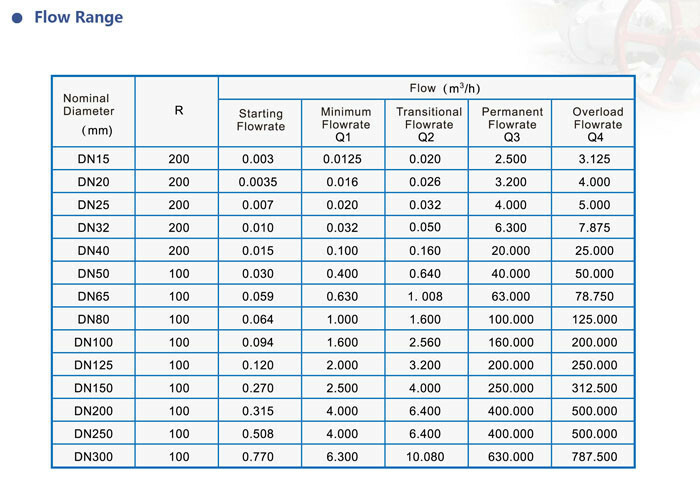 Low starting flow rate(Q1), avoid missing the small flow rate. 3. No pressure loss, IP68 of protction leve, suitable for varieties of work environment. 4. 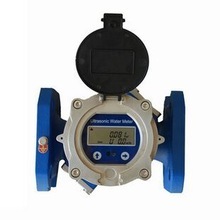 High accuracy make the water fees accurate and reliable. 5. No rotate abrasion, long service time. 1. Measuring principle: Ultrasonic two-channel time difference principle, the use of low-voltage multi-pulse transmitter circuit, double-balanced receiving circuit noise suppression. 2. 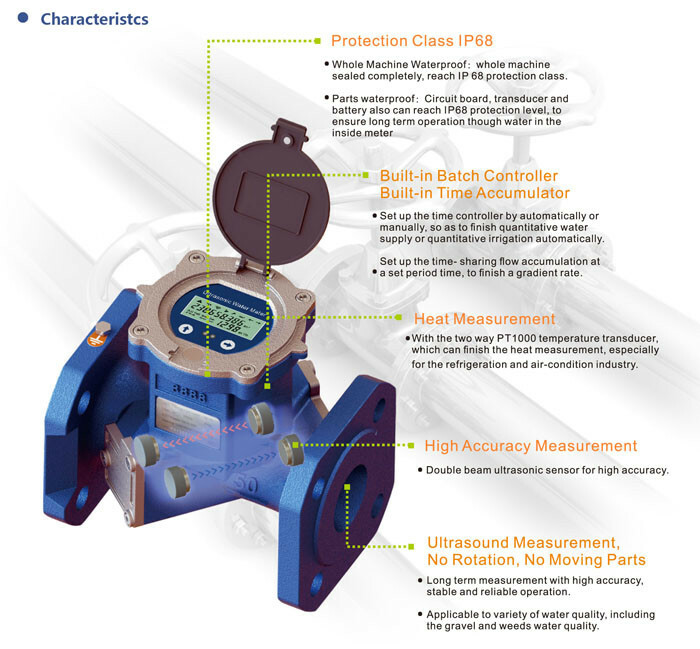 Measuring media: water, sea water, industrial waste water, suspended solids content of <10g / l, particle size <1 mm, liquid filled pipes. 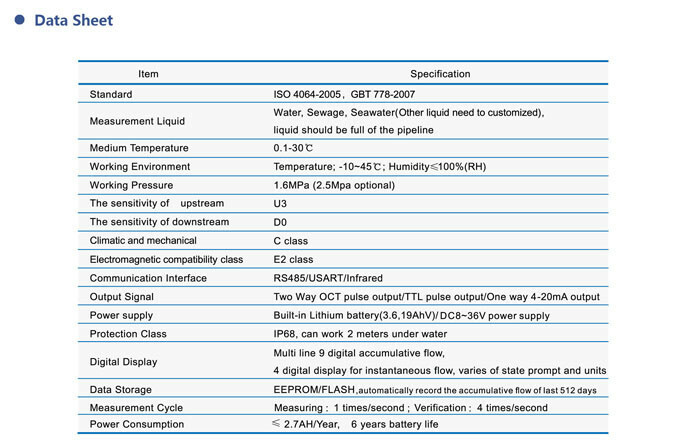 5.measurement period: Default 1 times / sec, verification status: 4 times / sec. 12. 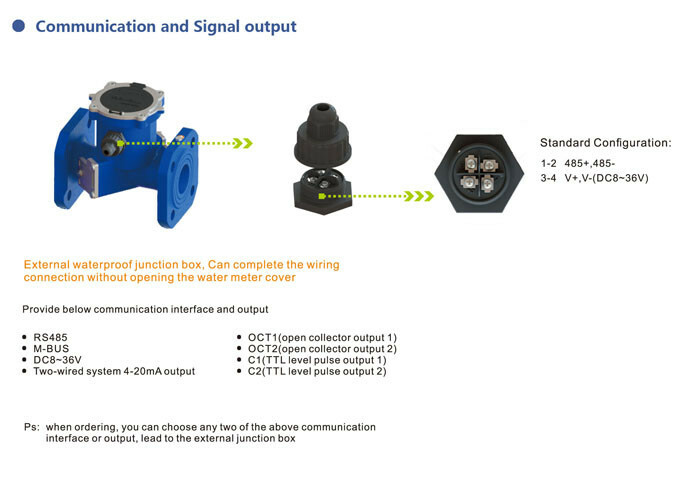 Communication interface: RS485 standard configuration; USART, infrared optional. 13. Output signal: two isolated OCT or TTL pulse output, 1 two-wire 4-20mA analog output. 14. Power supply: Built-in 3.6V lithium battery can work for more than 10 years / external DC8 ~ 36V DC power supply / two-wire 4-20mA power supply.